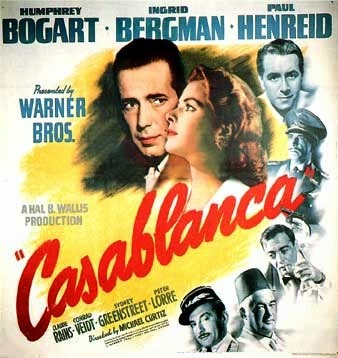 Wars always create the best love stories and Casablanca is the best among them. A true classic that never dies and one that has left a mark in a lot of love stories today. Casablanca is set right in the largest city of Morocco—Casablanca. It masks a wage against the Germans with the love affair between Rick and Ilsa—heroes and victims of early World War I in more ways than one. Casablanca has indeed set the bar for war-love stories as early as 1942. Martyrdom and sacrifice are the main ingredients in the film—very timely in a war. The characters not only seem to fight for freedom but for love as well. And that is very, very effective in making the story more dramatic, even if their acting seems robotic and lack emotion. A man who fell in love with the wrong woman at the wrong time, a married woman who was so lonely and alone at the time of uncertainty, a hero who keeps fighting for freedom and leaves his wife abandoned. All while they are fighting against the German authorities who try take away their freedom. Humphrey Bogart, Paul Henreid, and Claude Rains' highly guarded acting was a great mask for the men. But their eyes shout out loud! In fact, one of the cameo roles, the lady playing the role of Annina Brandel who asked for Rick’s [Humphrey Bogart] help for what they had that time as a “Visa” seemed too overacting for the bunch. The rest of the actors were at level with each other. Ingrid Bergman’s acting was called for because she was the leading lady of two men. The love triangle among Rick, Ilsa and Victor was heart-breakingly believable. It’s a lot more effective because of the script and transitioning of scenes. As long as you follow the script, you’ll understand the flow of events. The script made the story believable—like it actually happened in real life. No one will disagree if they add “based on a true story” at the subtitle. Only a true Casablanca fan will feel that tingling feeling when they hear: “Here’s looking at you, Kid.” The script’s consistency and repetition is one of the things I love about this classic film. Cinematography was all linear and basic, which I believe was just right for the film. A little risk to a more adventurous shot would be a little overboard and will take away the focus on the love triangle in the story. Who would have expected the ending?! It is the most unexpected ending of a movie of all time. You would think that Rick would choose to be selfish because Ilsa was obviously still madly in love with him, but he didn't follow his heart! He chose to be a hero and went on a suicide mission by staying in Casablanca and faced the German authorities. Surprisingly, the “odds” were at his side. For today’s youth, Casablanca may be a little too far-fetched. They won’t be able to relate to the difficult love story hindered by the ugly circumstances of war but to anyone who has an old soul (yes, like mine), you would easily fall deep in the trap of the interlacing web of events in the historic American night club in Casablanca. It never gets old and never fails to keep me at the edge of my seat at same time sweeping me off my feet! For that, it’s worth giving five glowing stars out of five!